The introduction of NDT Global's Atlas ultrasonic geometry (UG) service provides operators more access to geometric information about their pipelines than ever before. When conducting integrity management programmes, it is necessary for operators to have access to as much data and information about their pipelines as possible. Atlas UG provides a new way of conducting geometry inspections while offering a true picture of dents that may be present. Based on Evo Series 1.0 ultrasonic technology, Atlas UG is an inspection service that, in combination with crack or metal loss services, allows for the completion of a combined inspection of a pipeline in a single run. The data presented by Atlas UG allows operators to identify areas of deformation, even areas subject to previous reparations. Outlined here is an example of a series of Atlas UG scans, showing the Atlas UG tool's ability to inspect a pipeline's wall thickness, standoff, profile and cross-section. The ability to produce these scans and have them readily available underlines the essential role that the geometry inspection service plays in a pipeline operator's integrity management programme. As evident in the wall thickness scan, the two ‘lines’ either side of the dent indicates that not only is a dent present in the pipeline, but that this pipeline has had repairs performed on it previously. These lines represent a ‘Type B’ sleeve used in these earlier repairs. One advantage of using an ultrasonic inspection, rather than a mechanical caliper-based one, to measure geometry is the availability of essentially an ‘extra’ measurement of the pipeline's wall thickness. The standoff scan shows the shape of the dent, represented by the red and yellow coloring. 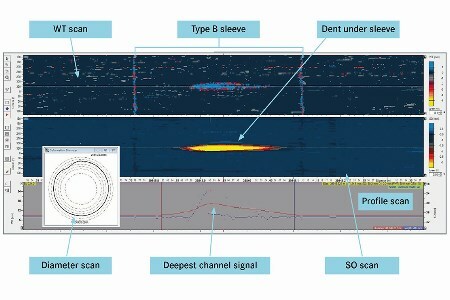 Beneath this, the profile scan shows the behaviour of the channel that displays the deepest point of the dent, represented by the red line. The upward movement of this red line highlights the shape of the dent present in the line. On the left-hand-side, we see the diameter scan. Working in accordance with the profile scan, analysts use the diameter scan to review the orientation (clock position) of the dent and how it impacts on the cross-section shape of the pipeline. The strength and accuracy of the scans provided by NDT Global's Atlas UG tool allows operators to continue to have a proactive and engaged integrity management programme. NDT Global compares fully aligned datasets, rather than separate ones or listings, presenting the operator with accurate information to locate combined threats. This ability to highlight the presence of additional metal elements, e.g. the sleeve here, affords operators more opportunity to have informed pipeline integrity management programmes, leading to safer pipelines with better prioritisation of remediation budgets.